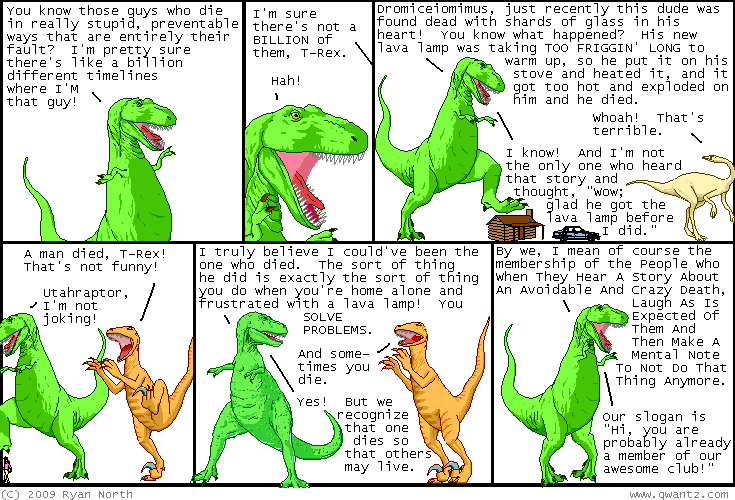 Dinosaur Comics - October 5th, 2009 - awesome fun times! October 5th, 2009: Thanks everyone who sent me in a fall footer! There were tons of great submissions. And here they are! Flynn sent in this action-packed scene, Madison sent in this interpretation of autumn, Sari sent in this serene scene, Lia sent in this amazing, classy and modern interpretation, Gregory sent in this pensive autumn farm scene, Shawn whipped this up in MS Paint, Donald sent in this lakeside scene (and then animated it! ), Rhea made this peaceful rural scene (complete with optional lake! ), Daniel composed this mountain view, Betsy showed the northern lights, and Eric gave us a sunset. It was really hard to choose just one! In the end it came down to what tiled nicely and what looked the best with a circling rhamphorhynchus and pteranodon above. It was a really hard choice, but I went with Rhea's version with a tiny woman added in. Thanks Rhea - it's awesome! And thanks to everyone else, too! I have the most talented readers. Everyone reading these words, pat yourselves on the back! And give yourself two bonus pats if your name is in the list above! One year ago today: also! dromiceiomimus! it's awful bright at 3 am where you live.